Built from quality materials and hand assembled, our cabinet construction process results in semi-custom cabinets that look custom. Skillful craftsmen construct long-lasting, quality cabinets that will stand the test of time in your home. 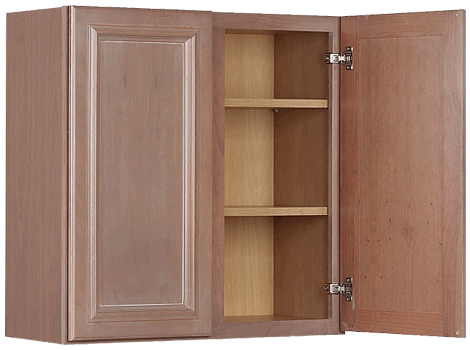 Wall cabinets feature adjustable shelves for maximum storage capacity. Concealed Whisper Touch ™ Hinges provide soft close doors and are adjustable six ways for the perfect alignment. Click on the image to the right to learn more. Concealed Whisper Touch Hinges close doors softly and quietly every time and are adjustable six ways for the perfect alignment. 3/4" thick full-depth shelves have a natural birch wood grain laminate. 3/4" plywood shelves supplied when All Plywood Construction upgrade is selected. Rounded face frames keep hands scrape free and duplicate the appearance of fine furniture, giving your cabinetry that extra touch of luxury. Standard construction has a natural birch wood grain laminate. Upgrade options include matching laminate interior or matching veneer interior. Natural birch veneer interior supplied when All Plywood Construction upgrade is selected. Base cabinets feature thicker back and bottom panels and I-beam construction. Full-depth solid wood drawer boxes feature dovetail construction. Full-extension Whisper Touch™ Drawer Runners create soft close drawers with easy access to contents. Click on the image to the left to learn more. Full-depth I-Beams, made of 1/2" engineered wood, provide stability and strong anchor points for countertop. 1/2" plywood I-Beams are supplied when All Plywood Construction upgrade is selected. 3/8" thick natural birch wood grain laminate. 3/8" plywood supplied when All Plywood Construction upgrade is selected. Standard construction 1/2" side panels with wood grain laminate that matches the specie of your door style. Available upgrades include: Plywood Ends, All Plywood Construction, Furniture Plywood Ends, and All Plywood Construction with Furniture End Panels. Rounded face frames keep hands scrape free and duplicate the appearance of fine furniture giving your cabinetry that extra touch of luxury. Our full-extension Whisper Touch Drawer Runners create soft close drawers with easy access to contents. 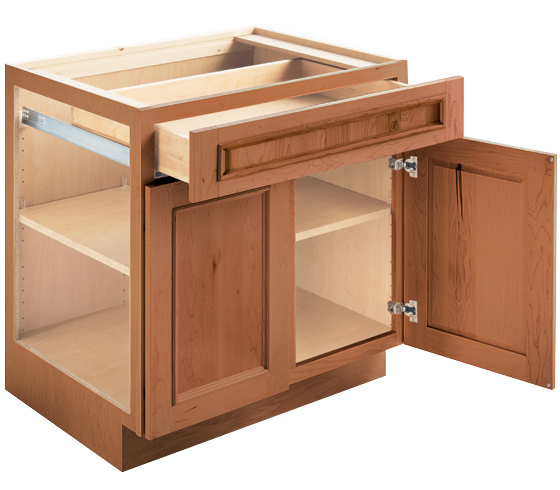 3/4" solid wood full-depth drawer with four-sided dovetail construction and 3/16" plywood bottom. 3/4" solid hardwood or laminate drawer fronts. 3/4" solid hardwood frames with solid or veneer center panels, or laminate doors. Clear pliable PermaSet bumpers dampen closure noise. 3/4" thick full-depth shelves have a natural birch wood grain laminate. Full-depth shelves provide 25% more usable storage space per cabinet than half-depth shelves. 3/4" plywood supplied when All Plywood Construction upgrade is selected. 1/2" thick birch wood grain laminate secured with dado joints. 1/2" thick plywood supplied when All Plywood Construction is selected. Concealed Whisper Touch Hinges close doors quietly every time and are adjustable six ways for the perfect alignment. Standard construction has a natural birch woodgrain laminate. Upgrade options include matching laminate interior or matching veneer interior. Natural birch veneer interior supplied when All Plywood Construction upgrade is selected. Silence is standard. Doors and drawers close softly and quietly every time, thanks to the Whisper Touch Hinge and Whisper Touch Drawer Runner. The Whisper Touch System is one of the many standard quality features on KraftMaid Cabinetry. Cabinet doors include concealed Whisper Touch Hinges which close doors softly and quietly, plus are adjustable six ways for the perfect alignment. Our Whisper Touch Drawer Runners provide easy access to contents and close drawers softly and quietly every time.